Occupy Nova Scotia will get its day in court, ruled a provincial court judge this afternoon in Halifax. In fact, it will get a whole week. Social activist and journalist Miles Howe pled not guilty to two charges: obstruction of justice (he sat on a tent that police were trying to remove from Victoria Park on Remembrance Day) and breach of a condition of release (he entered a public park), stemming from an arrest on the first charge. 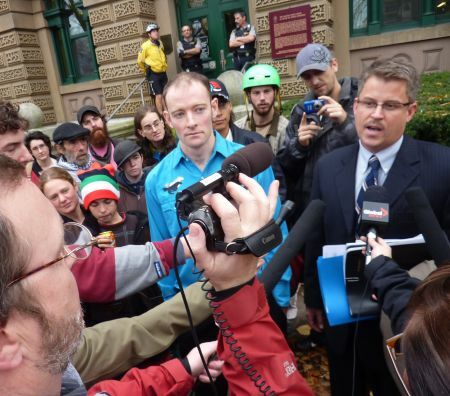 Howe and his lawyer, Gordon Allen, entered the not guilty plea based on the Canadian Charter of Rights and Freedoms--specifically, the freedom of peaceful assembly and the freedom of expression. Outside the courtroom Allen said that this trial could have implications beyond the Occupy movement since it is a Charter challenge and can set precedent for different kinds of protest, including strikes and rallies. Whether a person agrees or disagrees with the physical occupation or its message, said Allen, questions remain about how the eviction was carried out and whether or not it was quashing fundamental freedoms. He said that normally when a bylaw is broken the first line of action is a ticket and then if the offence continues perhaps some court action ensues in the form of an injunction--which is what the City of Vancouver is serving its own Occupation. The city is in court looking for an injunction against the protest rather than potentially breaking people's basic Charter-protected rights. Howe and Allen also worked to have his bail conditions changed--specifically the condition whereby Howe was not allowed in any public park. The judge agreed with Howe’s defense and he was released with the simple condition that he "keep the peace and be on good behaviour"--the rules that every citizen is bound by to comply with. Outside the courthouse Howe announced that he was going home to walk his dog in the Halifax Commons. Halifax Regional Police placed the "no parks" condition on Howe after he was arrested during the eviction of Occupy Nova Scotia at Victoria Park on November 11. It is the same condition facing most of the 14 individuals arrested that day, and is the condition Howe is charged with breaking on November 12 by attending a rally in support of Occupy Nova Scotia at Grand Parade--a park in Halifax. Today the judge agreed that this condition was unnecessary as Howe has no previous criminal record and is presumed innocent until proven guilty. This was a mini-victory, as the other social activists who were arrested may apply to change their conditions based on today's precedent. Howe is back in court on November 22 to set a date for the trial. A second defendant will enter his plea tomorrow at Nova Scotia provincial court tomorrow at 9:30 am. Attendance is welcome. Palmira Boutillier and Miles Howe share a residence. Submitted by Jdark (not verified) on Fri, 11/18/2011 - 08:39. Thank you, Miles Howe and Lawyer Allen, for mounting this challenge to the constitionality of police setting unreasonable conditions contravening citizens' basic rights. I am so happy that you have the courage to raise this issue in the courts because I have been so dismayed to see the trend of expansion of police force used on protesters, to ridiculous extremes. And I am so sorry that you were treated this way by police and the mayor, who seem to have no idea that they are trying to repress someone who shows compassion to those that need defending in society, a job that they should be doing themselves. Submitted by Anonymous in Halifax (not verified) on Sat, 11/19/2011 - 23:51. It takes a great deal of fortitude to take on the system, but honesty, integrity and values are what will prevail. Good for you Miles Howe and Gordon Allen. Submitted by W. Shatner (not verified) on Sun, 11/20/2011 - 00:05. It is a brave move to take on the system. It also appears that the judiciary is concerned with the violation of your rights and freedoms, that is why you are being granted a week to review your case. A far better use of taxpayers money than serving eviction notices and arresting people for obstruction of justice. As a taxpayer I say good on you Miles Howe and Gordon Allen, you have my blessings to use my money wisely. Honest, integrity and solid values will hold true in the end.